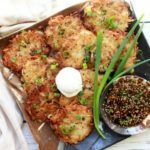 These delicious Asian-Inspired Potato Latkes are crispy and golden brown with Asian flavors and a special sauce! In a food processor fitted with a shredding disc, shred the potatoes and onion. Transfer the shredded potatoes and onion onto a large mixing bowl with cheese cloth or a cloth napkin on top. Twist and wring the bundle to release as much moisture as possible and place it back in a large, dry mixing bowl. Add to the mixture the eggs, flour, half of the scallions, ginger, garlic, sesame oil, and season with salt and pepper. Mix well to combine. In a large deep cast iron pan or skillet, add 1 to 2 inches of canola or vegetable oil and heat on medium- high heat. Test with a drop of water to see if the oil is hot enough (the drop of water should splatter when ready). Line a large baking sheet with paper towels and set aside. Place a healthy spoonful of the potato mix in hand and try to form a patty. Carefully place the potato mix in the pan. Gently press down on the mixture with a heat proof spatula to form a potato pancake. Repeat until pan is full but not crowded. After 2 to 3 minutes, or once potato pancake is golden brown, carefully flip and continue to cook for another 2 to 3 minutes more. Once both sides are golden brown, remove the latkes and place on the baking sheet lined with paper towels in single layers with paper towels in between each layer. Once dried, place on baking sheet lined with parchment paper or aluminum foil and place in the oven to keep warm until serving. To make the dipping sauce: In a small mixing bowl, whisk together all of the ingredients until well combined. Serve the latkes with the dipping sauce, a side of sour cream, chopped scallions, and toasted sesame seeds. You can use gluten-free flour instead of regular flour.